Wind power varies over time, mainly under the influence of meteorological fluctuations, on time scales ranging from seconds to years. Understanding these variations and their predictability is of primary importance for the integration and optimal utilisation of wind power in the power system, These issues are discussed in Chapters II.1 and II.2. Electric power systems are inherently variable in terms of demand and supply, however they are designed to cope effectively with these variations through their configuration, control systems and interconnection. In order to reduce variability, wind plant output should be aggregated to the greatest possible extent . As well as reducing fluctuations, geographically aggregating wind farm output results in an increased amount of firm wind power capacity in the system. Predictability is the key to managing wind power’s variability. The larger the area, the better the overall prediction of aggregated wind power, with a beneficial effect on the amount of balancing reserves required, especially when gate-closure times in the power market take the possible accuracy levels of wind power forecasting into account. In addition to the advantage of reducing the fluctuations, the effect of geographically aggregating wind farm output is in an increased amount of firm wind power capacity in the system. Note: The figure compares the hourly output of wind power capacity in four situations, calculated with simulated wind power. The simulations are based on December 2000 wind speeds and wind power capacity estimated for 2030. The large-scale integration of wind energy is seen in the context that wind will provide a substantial share of future European electricity demand. While wind energy covered around four per cent of electricity demand in 2008, EWEA targets for 2020 and 2030 are for penetration levels of 12–14 per cent and 21–28 per cent respectively, depending on future electricity demand. 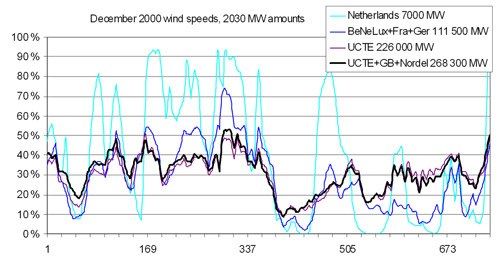 The established control methods and system reserves available for dealing with variable demand and supply are more than adequate for dealing with additional variability at wind energy penetration levels up to around 20 per cent, although the exact level depends on the nature of the specific system. The estimate for extra reserve requirements is around 2–4 per cent of the installed wind power capacity at 10 per cent wind energy penetration, depending on power system flexibility, short-term forecast quality and the gate-closure times in the power markets. At higher penetration levels, changes to systems and their method of operation may be required in order to accommodate the further integration of wind energy, an issue covered in Chapter II.3. In order to reduce the effort and cost of integration, power system design needs to be more flexible. This could be achieved by a combination of flexible generating units, storage systems, flexibility on the demand side, availability of interconnection capacity and more flexible rules in the power market. Table S.1 gives a detailed overview and categorisation of the effects wind power has on the power system. Short-term effects Voltage management Local/regional Seconds/minutes Wind farms can provide (dynamic) voltage support (design-dependent). Production efficiency of thermal and hydro System 1–24 hours Impact depends on how the system is operated and on the use of short-term forecasting. Transmission and distribution efficiency System or local 1–24 hours Depending on penetration level, wind farms may create additional investment costs or benefits. Spatially distributed wind energy can reduce network losses. Regulating reserves System Several minutes to hours Wind power can partially contribute to primary and secondary control. Discarded (wind) energy System Hours Wind power may exceed the amount the system can absorb at very high penetrations. Long-term effects System reliability (generation and transmission adequacy) System Years Wind power can contribute (capacity credit) to power system adequacy. 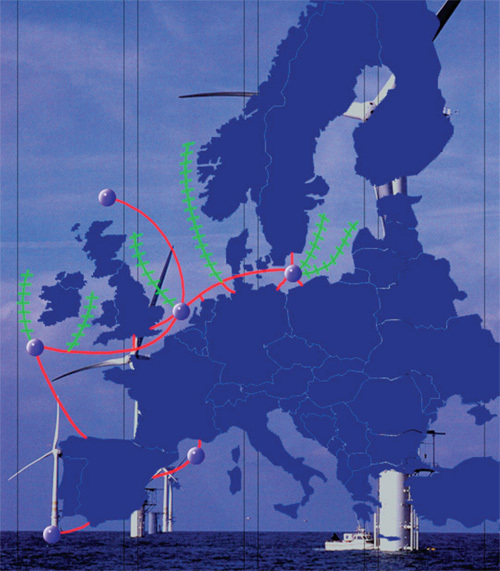 Figure S.6 provides a graphical overview of the various impacts of wind power on the power system, clearly showing both the local and system-wide impacts as well as the short- and long-term impacts on various affected aspects of the power system including grid infrastructure, system reserves and system adequacy. Note: Issues which are within the scope of Task 25 are circled in red. Wind energy, as a distributed and variable-output generation source, requires infrastructure investments and the implementation of new technology and grid-managementconcepts; these are presented in Chapter II.4. The large-scale integration of wind power requires a substantial increase in transmission capacity and other upgrade measures within, and between, the European Member States. Significant improvements can be achieved through network optimisation and other ‘soft’ measures, but the construction of new lines is also necessary. At the same time, the development of adequate and fair procedures need to be developed to provide grid access to wind power, even where grid capacity is limited. A transnational offshore grid would not only provide access to the huge offshore resource, but would also improve the cross-border power exchange between countries and alleviate congestion on existing interconnectors. Improving the European networks requires coordination in network planning to be strengthened at the European level, and greater cooperation is needed between all parties involved, especially transmission system operators (TSOs). At the distribution level, more active network management is required. Enhancing the grid’s suitability for increased transnational and regional electricity transport is in the interest of both the wind industry and the internal electricity market. 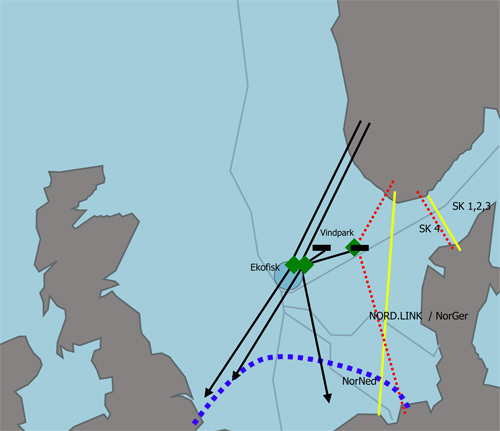 Figures S.7–S.9 show three examples of offshore grid configurations in the North. Specific technical requirements within Grid Codes in terms of tolerance, control of active and reactive power, protective devices and power quality are changing as penetration increases and wind power assumes additional power plant capabilities, such as active control and the provision of grid support services (Chapter II.5). There may also be a move towards markets for control services, rather than mandatory requirements. In principal, this would make economic sense, as generators most capable of providing the service would be contracted. As wind energy penetration increases, a concerted effort is needed from the wind power industry and system operators in order to develop a harmonized set of Grid Code requirements. For low wind energy penetrations levels, the relative capacity credit of wind power (that is ‘firm’ capacity as a fraction of total installed wind power capacity) is close to the average production (load factor) during the period under consideration - usually the time of highest demand. 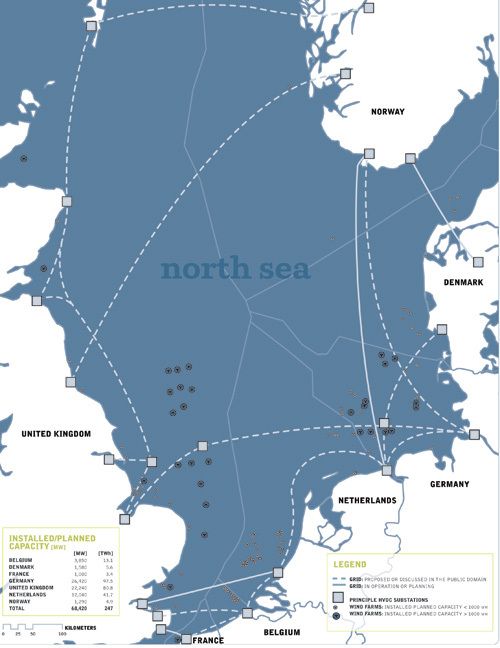 For North European countries, this is 25–30 per cent onshore and up to 50 per cent offshore. With increasing penetration levels of wind energy in the system, its relative capacity credit reduces. However, as Chapter II.6 illustrates, that less conventional capacity can be replaced, but rather that adding a new wind plant to a system with high wind power penetration levels will substitute less than the first wind plants in the system. In the interest of economical wind power integration, changes in market rules throughout Europe are required, so that markets operate faster and on shorter gate-closure times (typically three hours ahead or less). This will minimise forecasting uncertainty and last-minute balancing needs. Further substantial economic benefits are expected from the geographical enlargement of market and balancing areas, and from appropriate market rules in cross-border power exchange. The introduction of significant amounts of wind energy into the power system brings with it a series of economic impacts, both positive and negative. 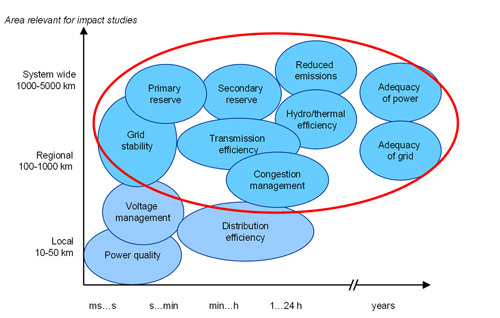 There are two main factors that determine wind energy integration costs: balancing needs and grid infrastructure (Chapter II.7). The additional balancing costs in power systems arise from the inherent variable nature of wind power which requires changes being made to other generators in order to deal with unpredicted deviations between supply and demand. Evidence from national studies shows that these additional costs represent only a small fraction of the generation costs of wind energy and of the overall balancing costs of the power system. 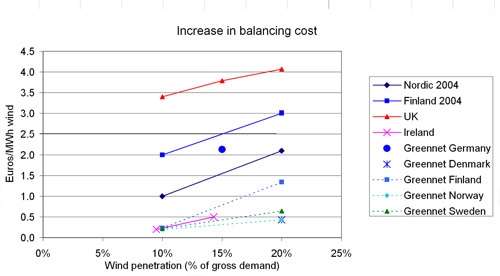 Figure S.10 illustrates the costs from several studies as a function of wind power penetration. Balancing costs increase on a linear basis with wind power penetration, but the absolute values are moderate and always less than €4/MWh at the 20 per cent level (and more often below €2/MWh). Network upgrade costs arise from the need to connect wind plants and cfrom the extra capacity trequired to carry the increased power flows in the transmission and distribution networks. Networks also need to be adapted to improve voltage management, and additional interconnection capacity between countries is required to optimally capture the benefits of the continental nature of wind resource. Any infrastructure improvement would provide multiple benefits to the system, and therefore its cost should not be allocated only to wind power generation. The cost of modifying power systems with significant amounts of wind energy increases in a quasi linear fashion with wind energy penetration. Identifying an ‘economic optimum’ is not easy, as costs are accompanied by benefits. Benefits include significant reductions in fossil fuel consumption and cost reductions due to decreased energy dependency, and they are already visible as lower prices in the power exchange markets where large amounts of wind power are offered. From the studies carried out so far, when extrapolating the results to high penetration levels, it is clear that the integration of more than 20 per cent of wind power into the EU power system would be economically beneficial. Experience and studies provide positive evidence on the feasibility and solutions for integrating the expected wind power capacity in Europe for 2020, 2030 and beyond. Today, the immediate questions mainly relate to the most economic way of dealing with the issues of power system design and operation, electrical network upgrade, connection rules, and electricity market design. One of the challenges is the creation of appropriate market rules, including incentives to enable power generation and transmission to develop towards being able to accommodate variable output and decentralised generation, notably by increasing flexibility and providing more interconnction capacity. Study is required at European level to provide a technical and scientific basis for grid upgrade and market organisation.